I think I love you. I know I love you. I always loved you. Calling all Hobos, Twisters, Freaks, and Geeks: pogo the crust out yr eyes, and marvel in this blindingly bright, full color 3-D world of ours. The sunsets are getting more beautiful 'ery damn day thanks to pollution. You can order some psilocybin on the internet and watch nukes explode online all from the comfort of your own bed! Get outdoors cuz life is beautiful and everything is terrible. It's so yo gabba great that God itself is here. Why not R-O-C-K in the USA? From yr Bedrock in Cali-forn-i-a! Do the Flintstone flop and go WAY OUT! Close yr eyes and pretend yr a cave person (like you really have to pretend) and yr riding Space Mountain at Disneyland for the 1st time. Yeah friend! 2001 is here again! Welcome back to the future! I'm a (music) nut. What kind of music am I into? Everything on the menu with extras on it. I can only choose one? I'll take ROCK 'N' ROLL, then. Rock 'n' Roll, in all it's twisted gnarly rooted glory, is what SHANNON AND THE CLAMS (da) do (ron ron) heads and tails above and more importantly, BEYOND the other troglodytes and biscuit-heads out there. Can a group be a "girl group" if there is only one girl in the group? Can a modern working band be considered "oldies"? No silly, but the rules are none, and anything goes, and this is PUNK, punk. Or is it rock ‘n’ roll, or whatever? It is SHANNON AND THE CLAMS and they do what they want. Do yrself a favor and tune in yr tinfoil hat. From pop ballads to doo woppers, bomp stompers and punk rippers, country clippers and some psych-o trippers, it's all R’n’R and it's all right there in the Clams’ hooded velvet trick bag. Ya feel lucky, punk? 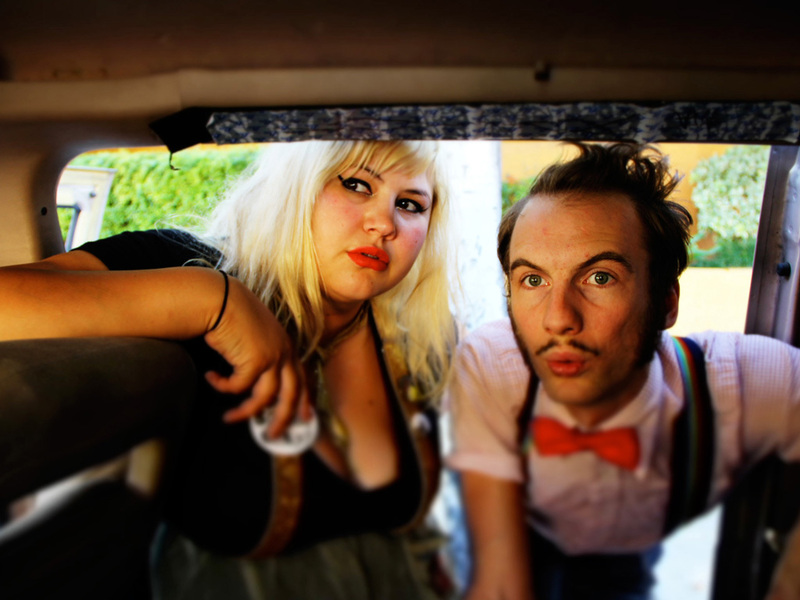 SHANNON AND THE CLAMS are rumored to be from NOW in Oakland California and comprised of Shannon Shaw (vocals, bass), Cody Blanchard (vocals, guitar), and Ian Amberson (drums, vocals). What started as an open mic project for a shy, young Shannon to try out some tunes ended with the Clams meeting and forming a band. Many have said to have been possessed by thee (eerily similar at times) haunted howls and beautiful growls of their two lead vocalists, hypnotized by their heavy heartbeats, and mesmerized by their magical music. This is a ride that contains both thrills and chills so hold on tight. Your ears may become infested with a real Buddy Holly jolly kinda joy (oh boy) while you stutter along to a hiccupy song. Take a scratch and a sniff at these stickers and get bit by their bad-brained snarls. It's always Christmas (if you want it). It's your party time, and it's excellent. Cry-yi-yi if you want to, but be sure to surf a splish-splash with a laugh later. The reality is, these Three Little Rascals broke free of our gang and their time, stopped thru the decades, soaked up the sounds ‘n’ spuds…. and like the lady and gentlemen they are, gifted us with the honor to hear their soundtrack of their brains – and their wonderful rock ‘n’ rule of the now and forever. SHANNON AND THE CLAMS present to all of us the greatest present: their first LP for Hardly Art, Dreams in the Rat House.